How can we help an organisation like yours? Almost two thirds of social workers are not actively looking for a job but could be tempted. We are uniquely placed to help you target this larger group of potential jobseekers. More than just a jobs board, Community Care supports councils and other social care organisations to build cultures that help retain practitioners. 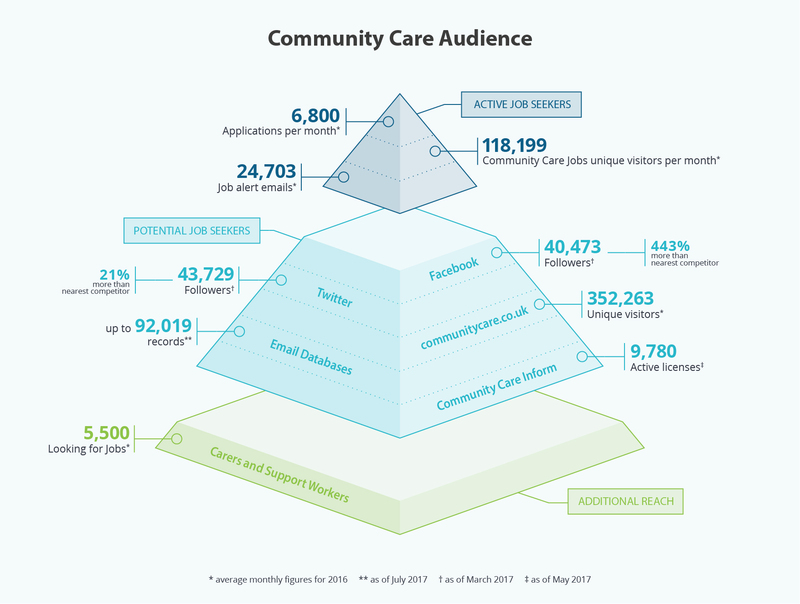 As the largest provider of information for social workers our data shows our audience is experienced and look to Community Care to keep their knowledge and practice up to date - just the type of jobseeker you want to attract. What's more, our unique research and understanding of frontline social work means we know the most effective methods of targeting your message so that it resonates with these high quality candidates. Whether you are an established social care recruitment consultancy or just starting out, our dedicated client partner will work with you to build a bespoke package to meet your needs. Plus our comprehensive CV database can help you target candidates and attract new ones. With “care” and “support workers” among our highest searched for terms, we have a wide pool of interested candidates looking for a job in the care sector – in fact, in the 6 months to December 2016 we had over 21,800* of them. So whether you have a few vacancies or an ongoing need, call our client partner to discuss our range of cost effective solutions. Partner with Community Care and we’ll work with you to create bespoke packages that target potential and active job candidates who are passionate about the profession and ready to take the next step in their career. Our new Employer Zone helps you promote your organisation as an employer of choice to the 64% of practitioners who say they could be tempted to move, as well as the 10% of active jobseekers. Tailored to your specific needs, we can take the stress out of recruiting and streamline your recruitment process by delivering relevant, ready to interview, candidates direct to your inbox. Providing complete access to our jobsite for the duration of your recruitment campaign, you can post an unlimited number of social care and social work positions across management, frontline and support roles. By adopting a variety of techniques including email and social media, we can work with you to create a focussed campaign that not only pinpoints the best and most relevant candidates, but can also target by geographical region, level of experience or job title. Showcase your organisation by exhibiting at Community Care LIVE, a learning event held twice a year in London and Manchester, and engage with experienced professionals who are committed to their continuing professional development. Read what some of our regular users think about Community Care Jobs. Our multi-award winning news website, communitycare.co.uk, sets the agenda in the sector and ensures professionals are up-to-date with the latest news and legal judgements. More that just a jobs board, our community supports social care professionals to improve outcomes for children, young people and adults. Community Care Inform improves the quality and consistency of social care decisions/decision making by equipping professionals with the evidence they need to make decisions. We support learning and ongoing professional development through innovative learning tools and face-to-face training at Community Care Live.